Deputy Rey Davalos (left) found 2 large ziplock bags filled with marijuana in a driver's pickup (also pictured is Sergeant Rob Thomas). Driver Arrested for Felony Possession, GOODRICH, May 4, 2014 - At approximately 12:40 pm Deputy Rey Davalos with the Polk County Sheriff's Office responded to an attempt to locate regarding a gray Chevy pickup that was reportedly driving recklessly on US-59 (north-bound) in the area of Goodrich. Deputy Davalos caught up with the vehicle at Polk Pick it Up convenience store and gas station. The driver had left his vehicle at the gas pumps and entered the store. As he came out of the store, Davalos approached the driver, Richard Allen Clark, 30, of Houston. As the two spoke, Davalos smelled the scent of marijuana coming from Clark's pickup (a gray Chevy Colorado). Davalos asked for consent to search Clark's vehicle, but Clark refused to give consent, however, with the scent of marijuana coming from the truck, probable cause was established. Davalos was backed up by Sergeant Rob Thomas. With probable cause established, Davalos initiated a vehicle search and found two large zip lock bags stuffed with marijuana (2 lbs. 5 ounces). Soon Deputy William Jerry also arrived to assist. Richard Clark was arrested and charged with felony possession of marijuana and public intoxication. Clark was transported to Polk County Jail and booked in. Clark's vehicle was recovered by Ken's Towing and will be stored at Pollock's Body Shop in Livingston. 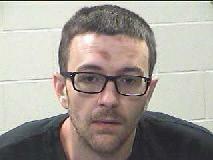 Richard Allen Clark, 30, of Houston, was charged with felony possession of marijuana and public intoxication. The hippy lettuce had a net weight of 2 lbs. 5 ounces. Deputy William Jerry arrived and looked at the contraband. Clark's vehicle was recovered by Ken's Towing. Mixi (left) and Molly (aka the M&M Sisters) were on duty for PolkCountyToday.com.